For over 60 years, The National Sheriffs' Association (NSA) has been dedicated to raising the bar of professionalism for those practicing in the criminal justice field. At the heart of this objective are collaborative programs designed to help enable sheriffs, their deputies, chiefs of police, and others in the field to perform their jobs to the best of their ability and to most effectively serve the people in their jurisdictions. As a result of the events that took place on September 11, 2001, these collaborations have become even more important and serve as a vital component in securing our homeland. National Sheriffs' Association values the alliances it has formed with the organizations listed below. The National Sheriffs' Association uses the resources below to help keep America safe. The mission of BJA is to provide leadership and services in grant administration and criminal justice policy development to support local, state, and tribal justice strategies to achieve safer communities. The mission of Citizen Corps is to harness the power of every individual through education, training, and volunteer service to help make communities safer, stronger, and better prepared to respond to the threats of terrorism, crime, public health issues, and disasters of all kinds. The Community Emergency Response Team (CERT) trains people in neighborhoods, the workplace, and schools in basic disaster response skills, such as fire suppression, urban search and rescue, and medical operations, and helps them take a more active role in emergency preparedness. Fire Corps enhances the ability of fire departments to utilize citizen advocates and provide individuals with opportunities to support their local fire and rescue departments with their time and talent. The Medical Reserve Corps (MRC) coordinates volunteer health professionals, as well as other citizens with an interest in health issues, to provide ongoing support for community public health needs and resources during large-scale emergencies. Volunteers in Police Service (VIPS) works to enhance the capacity of state and local law enforcement to utilize volunteers. VIPS serves as a gateway to resources and information for and about law enforcement volunteer programs. Funded by the Bureau of Justice Assistance, Office of Justice Programs, U.S. Department of Justice, VIPS is managed and implemented by the International Association of Chiefs of Police. This Office was created as a result of the Violent Crime Control and Law Enforcement Act of 1994. As a component of the Justice Department, the mission of theOffice is to advance community policing in jurisdictions of all sizes across the country. Famous for its famous dog's motto, "Take a Bite out of Crime," the National Crime Prevention Council is a national non-profit organization dedicated to educating individuals and communities about crime prevention. 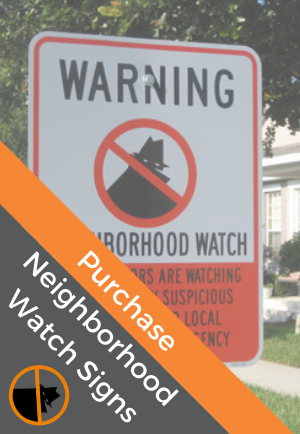 The National Association of Town Watch (NATW) is a non-profit organization dedicated to the development and promotion of organized, law enforcement-affiliated crime and drug prevention programs.